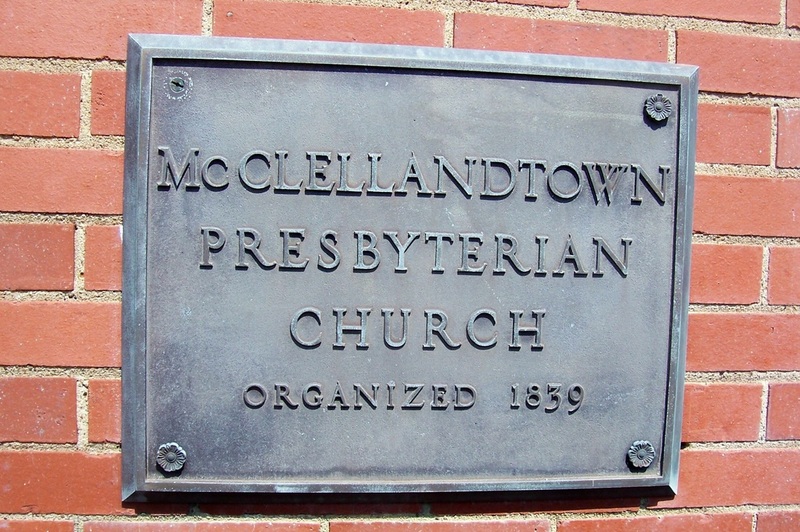 organized themselves on November 23, 1839 as the McClellandtown Presbyterian Church. The church was established with thirty-four charter members and became a member congregation of Redstone Presbytery in the Presbyterian Church, (U.S.A.) which continues today. A brick building was constructed on Jacob Deffenbaugh's land in 1843, the same property where the church and cemetery are now located. This first building was destroyed by fire in 1864 and replaced February 15, 1867. This building was remodeled in 1878 and again in 1931-32 when the basement was excavated. And addition was added with five classrooms, restrooms, and a choir loft was finished in 1950. In 1970 a spire and carillon were added; in 1976 the basement was enlarged by excavation for the installation of a modern kitchen. 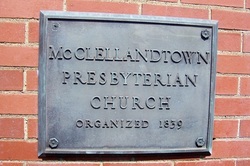 During most of the church's history they have always been yoked with other area Presbyterian churches to share a pastor and for many years McClellandtown has been yoked with Grace Chapel Presbyterian Church on Walnut Hill Road in High House near Smithfield, PA.